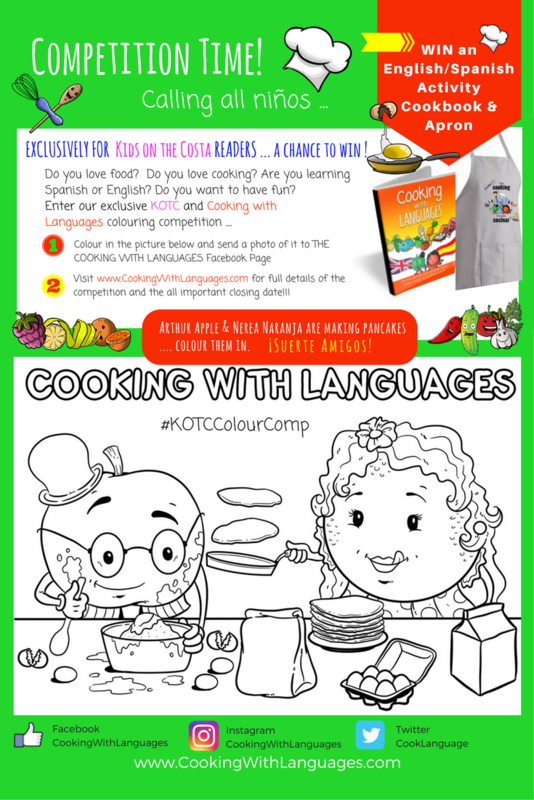 To celebrate the launch of our first Cooking With Languages products, our bilingual English/Spanish Activity Cookbook and Apron, we are offering our very first giveaway. 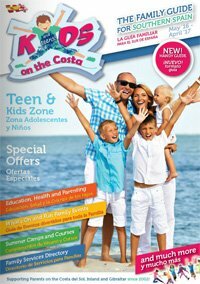 KOTC is our favourite magazine for kids and families on the Costa del Sol and southern Spain! The first publication of Kids On the Costa Magazine was launched in March 2002. It is 15 years old! What date will the latest edition be published? Until what date will the publication with the competition in be distributed? The last distribution date of this publication will be February 2018. What is the distribution area? The printed magazines are distributed at many points, from Malaga City to Gibraltar on the Coast and neighbouring inland areas such as Coin and Alhaurin el Grande. 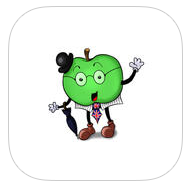 The online digital version is read worldwide. How Can You Enter Our Competition? 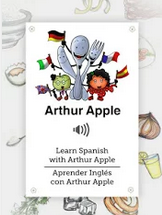 Colour in our picture of Arthur Apple and Nerea Naranja having fun and getting messy in the kitchen. 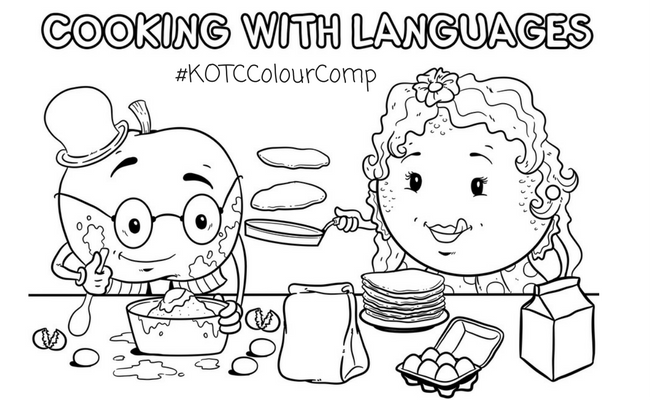 Ask your parents to take a photograph of you holding the coloured picture and upload it to our Cooking With Languages Facebook page. (LINK HERE) NOTE: Make sure you “Like” the Facebook Page too as the winners will be announced there! 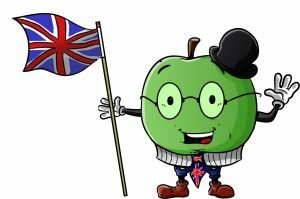 Add the following dates to your diary: SATURDAY 22nd JULY 2017 and SATURDAY 16TH DECEMBER 2017 and be sure to visit the Cooking With Languages Facebook page on those dates as that is when the two winners will be announced. Ask your parents to take a photograph of you holding the coloured picture and upload it to the Kids on the Costa Facebook page. 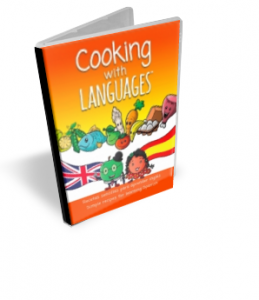 (LINK HERE) NOTE: Make sure you “Like” the Cooking With Languages Facebook Page too as the winners will be announced there! 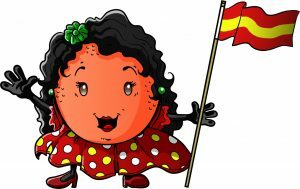 Add the following dates to your diary SATURDAY 15TH JULY 2017 and SATURDAY 16TH DECEMBER 2017 and be sure to visit the Cooking With Languages Facebook page on those dates as that is when the two winners will be announced.